We suggest Quality Home Watch Services for your convenience and peace of mind. To feature your Florida business in Naples Marco Living, contact us. Steve and Judy have been Naples residents for over 50 years and are keenly aware of the Florida climate, conditions and potential issues. Our focus is to manage your property while you are away on the basis of the services you desire. Our goal is to not only protect your asset, but also provide customized homewatch solutions that save you time, money, and frustration. Visit QualityHomeWatchNaples.com. Both Steve and Judy Alander are longtime residents of Naples. Steve arrived with his parents as a baby in 1952. Judy arrived with her family in the summer of 1966 to enter Naples High School. If you do the math, the two of them have resided in this area over 50 years. While they have seen many changes over the years, neither could imagine the growth of homes and businesses. 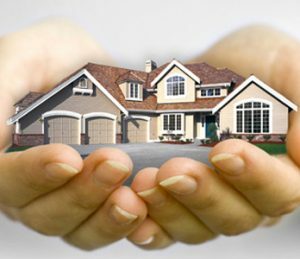 They established Quality Home Watch & Care Services as a family owned and operated and much-needed service for the Naples area homeowners to protect your home while you are away. Family owned and operated means you get the genuine care that only a family can provide. They believe in honesty and integrity and would like to offer their company to be at YOUR service. They provide you a one-stop-home watch-shop with professional, courteous, and honest service. Since they have been residents in this area over 50+ years, they are keenly aware of the Florida climate, conditions and potential issues. Their focus is to manage your property while you are away on the basis of the services you desire. Their goal is to protect your asset. Steve has mostly been self-employed and of the two of them, is the entrepreneur of the team. His background was primarily construction for years but his love of cars came from his father. Judy’s background has been commercial lines insurance and working in the legal field but for the past 25 years, she has been an executive assistant to CEO’s of various companies in the Naples area. Their daughter Mandi was born in Naples; she remained in Naples, she married Mark and they have two children, Robert and Mia who attend Lake Park Elementary School. With the phenomenal growth of homes in our area and some of our residents are “part-time” only living here for a few months out of the year before they return to their northern home. Judy recognized the need for a reliable home watch service. She had, for years, a few clients on a smaller scale. After several discussions with Steve, she felt this was something the two of them could do together and do better, taking their home watch business to a more professional level. September 10, 2017 – Irma made her presence known – much like Hurricane Donna did 57 years ago to the day, September 10, 1960. Steve was almost 10 years old when Donna visited Naples. 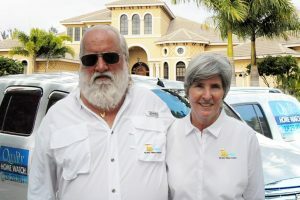 Since Judy and Steve’s daughter and son in law are both first responders, both were called into work – grandchildren Robert and Mia joined Judy and Steve at their home, as did other family members and friends to ride Irma out. Their reaction the next morning was their property looked like a war zone with the vegetation loss they experienced however both Judy and Steve look at life with “a glass half full” attitude – their home and Steve’s shop was intact. It could have been worse as many others in our community suffered much more severe loss. It was Tuesday, September 12th before the county gave the all-clear before anyone could get on the roads. They started on the north side of Naples visiting their client’s homes taking pictures, assessing the damage, emptying freezers and refrigerators, etc. A husband-wife client had the cutest little home in Goodland they had purchased and had put finishing touches on before they departed north. This client by far had the worst damage of all Judy and Steve’s clients. Working with the clients’ long distance and with the help of a couple of friends, the house had to be completely gutted. They met with several insurance adjustors and contractors to start the process for their clients. Steve secured an air-conditioned storage unit to move what furniture and contents could be salvaged as mold had already started growing after only two days in our September heat and humidity. Fortunately, there is a happy ending to this story, the clients are restoring the little cottage back to its original splendor. We have frequent storms during our summer months, for example, if your circuit breaker is tripped and your air conditioner or refrigerator is off, conditions are ripe for problems. Your friends who offered to keep an eye on your home go on vacation or has a family emergency and are called out of town. Your roof can have leaks either from rain or your upstairs neighbor has a flood due to their negligence. Rodents/insects have found a way into your home. Quality Home Watch services can be tailored to fit each client’s needs. Some leave vehicles here in Naples when they return north. Starting the car keeps the battery charged, a short drive around the block keeps the fluids running and avoids “square tires” from just sitting for months. They know of some clients who before securing their services returned to dirty cars with dead batteries. It’s much nicer returning to a car that starts, is clean and full of gas. Judy and Steve cannot stress enough the need for periodic checks of your home. There is a multitude of issues which can occur during your absence and without anyone checking your property; many things can go wrong with an unattended property. That is why they strongly recommend 2-4 inspection visits per month. They will communicate with you after each visit or in the event of an emergency as needed; remember…unforeseen damage can happen at any time. They will provide regular inspections regarding your property which will exceed your expectations. For example, should a storm, tropical depression or hurricane threaten our area, they will check your property as soon as possible before to secure the home and as soon as possible afterwards to communicate with you; Should an item need to be addressed resulting from a maintenance, service, or a security need, they would communicate with you immediately, with photos, if necessary. We will also inspect the exterior each visit for potential issues with irrigation systems, signs of vandalism and remove any flyers left on your door, remove newspapers, etc. Their job as “home watch” inspectors is to visually inspect your home and property for obvious issues. If they notice any abnormalities, they immediately report it to you. It’s not uncommon for Judy to receive by email a grocery list for a client prior to their return. How nice to arrive back to Naples late at night with the water turned on, water heater turned on, the ice machine turned on and groceries for your morning coffee and breakfast. Quality Home Watch is licensed and insured in the City of Naples, Collier County and the State of Florida. They have liability insurance in the amount of $2,000,000. Judy and Steve both have a strong commitment to exceeding your expectations – their word is their bond and as the name suggests, they perform Quality Home Watch!